← Should a Dungeon Master Invite Players to Help Create the D&D World Beyond Their Characters? 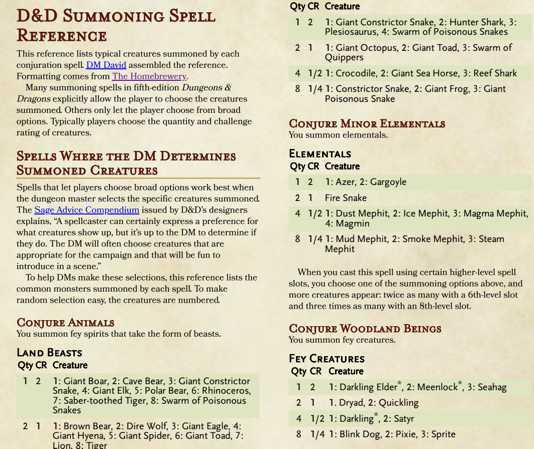 This entry was posted in Dungeon master's tools and tagged conjuration, spells. Bookmark the permalink. I’m not generally a fan of the summoning spells. Too strong (they can be like a fireball of damage every round, round after round, for the casting of one spell), ties up the terrain impeding movement (especially by locking down melee fighters, preventing a dynamic combat), and is a slog (in almost any combat, the monsters lack the damage to kill more than a couple of the summoned monsters). That last bit is what kills it for me. At the meta level, the monsters should ignore the summoned creatures, because killing them is basically impossible unless they’re a horde of low CR creatures and the monsters have AoE. So, the easy pick is to target the summoner and break their concentration, but that takes away from what the player who did the summoning wants. I haven’t found a happy medium. In our last campaign, the druid wanted to summon all the time. What they did for balance was to go through the list alphabetically. If the terrain was wrong (aquatic) they skipped that monster until the next appropriate time. That worked well to keep the combats more interesting and prevent cheesy choices, but the slog aspect was still a problem.